CRM list has a special dashboard. This will display when you click on a CRM list in the left menu or on the "Email lists" tab. The dashboard helps to review the most important data of CRM lists, for example current or due tasks, how many subscribers are in certain sales statuses etc. The search panel is at the top of the dashboard. You can search among subscribers, tasks or in your network. When you search subscribers you can define whether you want to search in this list or in all lists. If you check in all fields the search term will be searched not only in email, first name, last name and company fields, but in all fields of the list. If you search among tasks you can choose whether you want to search among open, closed or all tasks. 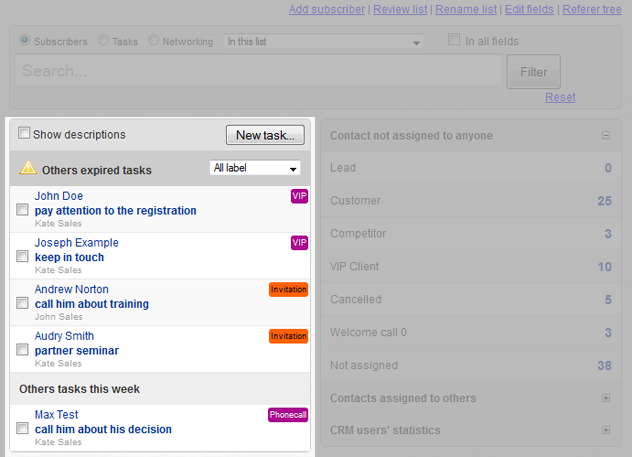 In the task list you can see your due tasks and tasks that will be immediate soon. 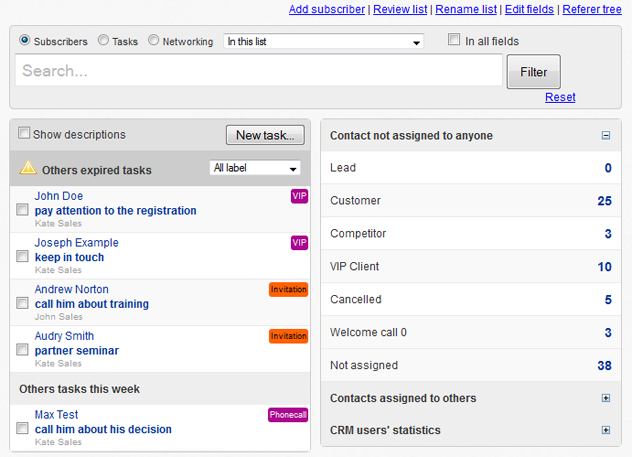 If you have supervisor CRM permission you can see other CRM users' incomplete tasks. 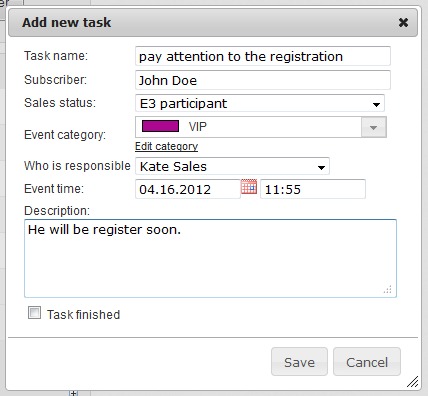 The name of the task, the contact and the name of the assigned crm user appear on the list. If you click on the subscriber's name it opens the subscriber's data sheet. If you move your mouse over the name of a task the description of the task will appear on a layer. If you want to see all the descriptions of the tasks check the "Show descriptions" option at the top of the task list. If you click on the name of the task it opens the task dialog where you can edit the details of the task. You can place every task into a category. The category will appear as a label in the task list at the right side. 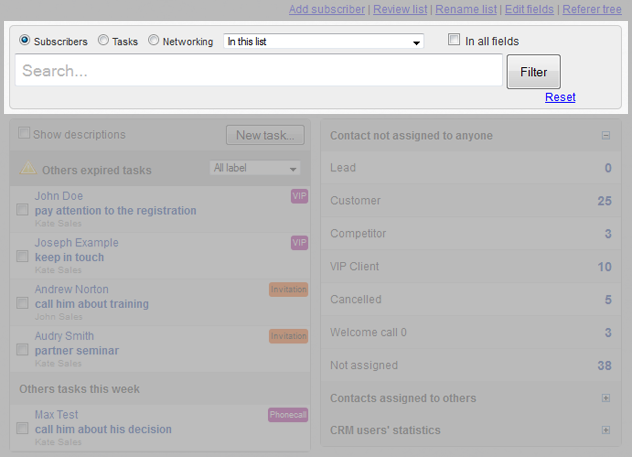 You can filter tasks by their categories using the dropdown list at the top of the task list. At the right side of the CRM dashboard you can see the sales statuses and the actual number of contacts in the given status. At the top there are contacts who haven't been assigned to a crm user yet, below that in the "Contacts assigned to others" list there are those who are already assigned to a CRM user. A junior CRM user can access contacts assigned to him/her, CRM users with other permission can access all the contacts. 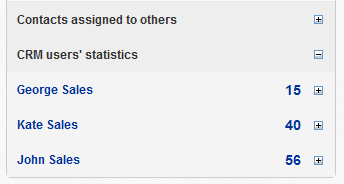 If you click to the number next to the status it displays the lists of the given contacts that are in the given status. The statistics of CRM users are accessible under the status review. By clicking the CRM user's name the weekly or monthly performance review appears. 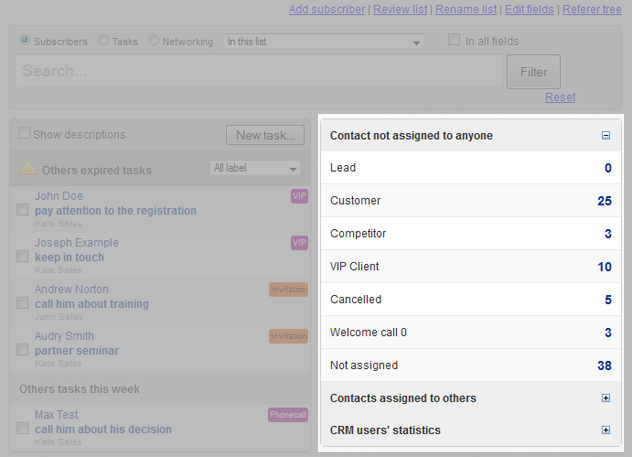 Click the "[+]" icon next to the CRM user's name and you will see the number of assigned contacts listed by sales status. If you click this number the list of the assigned contacts in the given status will be displayed.